If you are on the hunt for good quality roof brackets for your next job, AJC Tools is the place for you! These are great tools when used safely and properly! 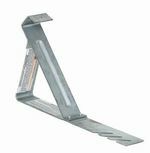 We offer a wide range of roofing brackets, at varying angles. Take a look at our selection below, and find an AJC roof bracket dealer near you. If you have any questions, feel free to contact us – we love hearing from our customers! Holds plank at 45 degree angle for up to and including a 12/12 pitch. Easy on/off installation. Holds plank at 45 degree angle for up to and including a 12/12 pitch. Made for using 2x8 or 2x10 planks. Simply remove insert for 2x10 use. Holds 2x6 plank at 60 degree angle for up to and including a 16/12 pitch. These slate roof brackets hold 2x12 planks. We are also pleased to say that they have six adjustable positions to fit a 33 to 55-degree angle. And last but not least, these 8 pound slaters brackets fold compactly for storage!